The Ten-Year-Old has been an Elvis fan for at least six of her ten years. There have been a few rocky points in their relationship, however. Like that time The Four-Year-Old learned that Elvis didn’t really like cats. 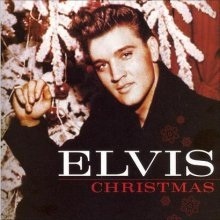 And then there was that dark December day in 2011 when Mommyo played Elvis’s Christmas album, and The (then) Four-Year-Old abruptly discovered her idol wasn’t perfect. She recovered, though, and with her usual optimism she decided that all her idol needed to find his way again was a timely bit of good advice. Your Christmas album has too many slow songs. Slow songs aren’t as pretty as the fast ones. I haven’t quite figured out how to mail it yet.